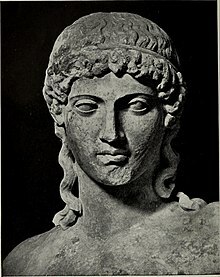 A statue of the Greek and Roman god Apollo, possibly an early work of Phidias, in the collection of the Museo delle Terme (now part of the National Roman Museum) in Rome, Italy. In Ancient Greece a paean was originally a song – especially a thanksgiving or victory hymn – to Apollo, or sometimes another god or goddess. From Latin paeān (“a hymn, especially a victory hymn, to Apollo or another god”), from Ancient Greek παιᾱ́ν (paiā́n, “a chant or song, especially a thanksgiving or victory hymn, to Apollo under the name Παιᾱ́ν (Paiā́n)”), from the phrase Ἰὼ Παιᾱ́ν (Iṑ Paiā́n, “O Paean!, Thanks to Paean!”). According to Homer, Paián or Paean was the name of the physician of the gods; its further etymology is unclear. It has been suggested that Παιᾱ́ν is derived from *παιάϝων (*paiáwōn, “one who heals illnesses through magic”), from *παῖϝα (*paîwa), *παϝία (*pawía, “to blow”), related to παίω (paíō, “to hit, strike”) (from Proto-Indo-European *pēu-, *pyu-, *pū- (“to hit; to cut”)), or from παύω (paúō, “to bring to an end; to abate, to stop”) (from Proto-Indo-European *peh₂w- (“few, little; smallness”)), or that it may be a Pre-Greek word. Compare Middle French and French paean (also French péan), Italian peana, Portuguese peã, péan. In the mean time I am going to that part, whence I think it convenient for the battle to begin; and, as I paſs, ſhall consider how things are with reſpect to ourſelves. When I come there, and we are juſt ready to engage, I ſhall begin the Pœan;[sic] and do you follow. Oh, happy ſoldier! had thy worth been try'd, / In pious daring, on thy country's ſide! / Oh, had thy ſword Iberian battles known, / Or purple with Cantabrian ſlaughter grown; / How had thy name in deathleſs annals ſhone! / But now no Roman Pæan ſhalt thou ſing, / Nor peaceful triumphs to thy country bring, / […] Oh, hapleſs victor thou! oh, vainly brave! / How haſt thou fought, to make thyſelf a ſlave! The pæans were songs, of which the tune and words expressed courage and confidence. […] Pæans were sung, not only when there was a hope of being able, by the help of the gods, to overcome a great and imminent danger, but when the danger was happily past; they were songs of hope and confidence as well as of thanksgiving for victory and safety. (by extension) Any loud and joyous song; a song of triumph. Long before they reached this place, which was situated at the other end of the village, they heard the pæan of May carolled by a hundred voices; and, on entering the area, they immediately joined in the chorus. But what tribute shall we bestow, what sacred pæan shall we raise over the tombs of those who dared, in the face of unrivalled power, and within the reach of majesty, to blow the blast of freedom throughout a subject continent? (by extension) An enthusiastic expression of praise. The barbarian, wandering in nature's wilds, plucking the fruits as they grow, or destroying the game for his meat, and quenching his thirst with the waters of the gurgling rill, may furnish the poet with a theme for a pean to the goddess of Natural Liberty; but he will be a barbarian still, and his children after him, will roam over the same uncultivated wastes, and sleep in the same caves and dens, until they learn to associate with others and combine their efforts for mutual good. Unlike other accounts, Eagles of the RAF is not simply a paean to the pilots as special heroes and "aces," though many performed heroically and some sacrificed their lives. Mexico's ruling elites have long played up their supposed commitment to the nation's laboring masses. Article 123 of the 1917 Constitution promulgated the most advanced labor code of its time, and revolutionary rhetoric has always rung with paeans to labor. Antimodern romanticism is not primarily a complaint about lost nature; it is mainly a pean to lost values. Modernity is relativistic, the existentialists complain; it has lost a sense of real values, true courage, meaningful integrity. Veteran world travelers visiting Newport, Rhode Island, in the first years of the twentieth century were as impressed as neophytes by the sheer concentration of opulent summer villas ringing this old colonial seaport. Grand Duke Boris [Vladimirovich] of Russia's paean to the resort struck a characteristic chord: "I have never dreamed of such luxury as I have seen at Newport." (transitive, rare) To sing a paean; to praise. Then let the pæaned hymn aspire, / Nor longer court unholy gloom; / Let happier music wake thy lyre, / Than haunts the precincts of the tomb. Solemn, "as it were a pause in nature," was his [George Washington's] transit to eternity; thronged by the shades of heroes, his approach to the confines of bliss; pæaned by the songs of angels, his journey beyond the stars! What harbinger victorious tidings brings, / And yonder soars on golden wings? / Beams on the solar god her bright undazzled eyes, / Proclaims with pæaning trump some hero to the skies! Yea, with gladness did they pæan, bowing low before my car, / In my ears their homage echoed from the sunrise to the star. Spring is the season of Nature's most lavish output—why not the publisher's also? Some may object that the output of the publisher does not resemble that of Nature; but this criticism seems to us to be trivial. The simple fact that Nature and the publisher are working together means everything. And therefore we are paeaning our paeans of literary joy. We celebrate books. We celebrate literary people. We hail authors and authoresses. ^ Ernest A[rthur] Gardner (1910; 1915 reprint), “Phidias”, in Six Greek Sculptors (Library of Art), London: Duckworth and Co.; New York, N.Y.: Charles Scribner's Sons, OCLC 1133263, plate XXXI facing page 115. ^ “paean, n.”, in OED Online ⁠ , Oxford: Oxford University Press, March 2005. ^ Robert [Stephen Paul] Beekes (2009) Etymological Dictionary of Greek (Leiden Indo-European Etymological Dictionary Series; 10), Leiden: Brill, →ISBN, page 1142; see also pages 1144 and 1159. From Ancient Greek παιᾱ́ν (paiā́n, “chant, song of praise”). (Ancient Greece, historical) Hymn to Apollo. (by extension) Hymn or song of victory or praise.